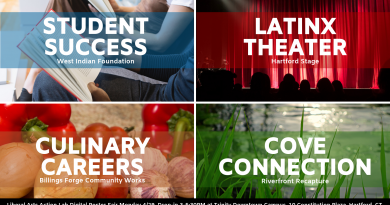 In the Liberal Arts Action Lab, Hartford community partners define problems facing the city and collaborate with teams of students and faculty to research and publicly share possible solutions. The Action Lab is an educational partnership between Capital Community College and Trinity College in Hartford, the capital city of Connecticut. Our goals are to strengthen the city and its role in the region, spark social innovation, and support civic engagement and sustainability. See completed and current projects. Our application matching process brings together teams that include a community partner (broadly defined as neighborhood groups, non-profit organizations, government agencies, social entrepreneurs, etc. ), a faculty fellow (academic or staff experts from any Hartford Consortium for Higher Education campus), and 4-5 students from Capital Community College or Trinity College. Each semester, a total of 20 Action Lab students will learn research skills and digital tools in two afternoon courses taught by Director Megan Brown. The Action Lab is based downtown at 10 Constitution Plaza, Hartford, CT. Please contact us to learn how to participate. To learn how to reserve the space, please contact the Communications and Program Assistant, Morgan Finn. The Liberal Arts Action Lab is part of the Center for Hartford Engagement and Research (CHER) at Trinity College.